Thinking about transferring to Western Michigan University? Attend Kellogg Community College’s WMU On-Site Admissions Day on KCC’s North Avenue campus in Battle Creek this month to meet with a WMU admissions representative, have your application reviewed and receive an admissions decision instantly! During the event WMU will waive its application fee and meet with students on KCC’s campus to review their application materials and save them a trip out to Kalamazoo. WMU financial aid representatives will also be available. 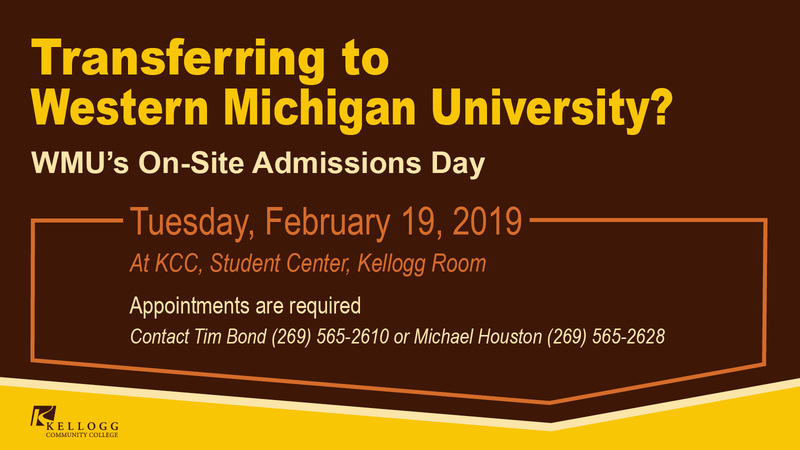 KCC’s WMU On-Site Admission Day will be held on Tuesday, Feb. 19, and appointments are required. For more information or to make an appointment to begin taking the next steps toward becoming a Bronco, contact KCC Counselor Tim Bond at 269-565-2610 or KCC Academic Advisor Michael Houston at 269-565-2628.